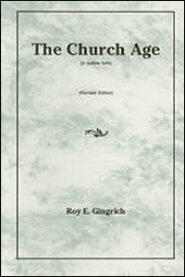 In this little volume, Mr. Roy Gingrich has given us a concise treatment of “the church age,” an excellent survey of the Bible’s teaching on this subject. Mr. Gingrich has obviously spent much time and labor in preparation for the writing of this book. Much more has been written on “the church age” by other men, but I find that this book says all that needs to be said and says it in a concise way. It gives its readers an overall view of its subject without losing them in page after page of details. Therefore, I believe that this work would be an excellent addition to any and every Christian’s library.